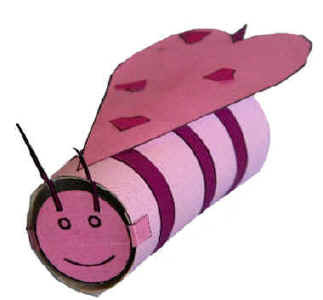 My “Bee Mine” Valentine’s bee sounds like a bee and acts like a bee, but is a bit pinker than the garden variety. If you do not have a printer, just take a peek at the templates and draw the pieces out yourself! something to color with (if you’ve opted for the B&W version). Print out the Valentine’s Day template of choice. Glue on the hearts in whatever way you choose to decorate the bee and/or wings. 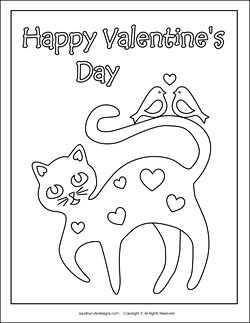 Use the template for the black and white printer on pink or red colored construction paper. You can seal the bottom the this cardboard tube craft (just glue on a circle of paper). Then fill it with cinnamon hearts (or other candies) and seal to top. What a cool way to give a Valentine’s treat to a friend! Glue on the head and the six hands (have the children count the hands. Butterflies have 6 legs). Glue the hearts together (biggest to smallest). Have your child sort biggest to smallest as an educational activity (for 3 year olds). If you are precutting everything, you may prefer to cut out your own hearts from construction paper instead of using the wings template (it’s quicker to fold construction paper and cut than it is to cut out the templates). But if you’re giving your child practice with scissors, then the templates are great. 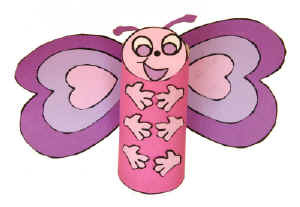 Glue the wings onto the back of the tp roll. One of the best parts of Valentine’s Day is the recieving and giving of valentine’s day cards. When I was little I would spend an entire weekend with my mom putting together Valentine’s day treats for all of my classmates. Then, in class, we would all go around and deliver our cards and treats to each others Valentine’s holders. 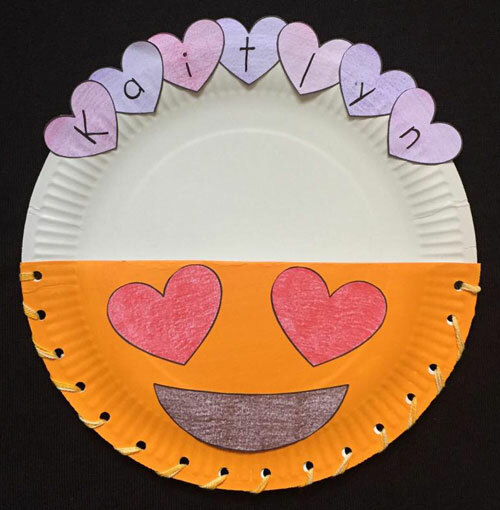 This craft is a very cute version of a Valentine’s Day card holder, and the adorable emoji theme adds some extra excitment. Cut out the template pieces (the pieces of the emoji face are8 the same angle as they should be when you glue them to the paper plate, this should help with positioning). Paint the bottom of one paper plate yellow, and let dry. Once dry gut the paper plate in half (you only need on half). 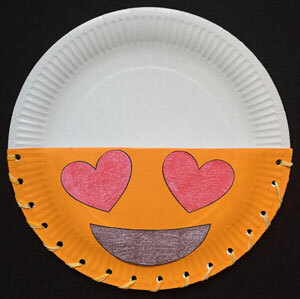 Glue the emoji face template pieces onto the painted paper plate half. Put the rims of the plates together so that it forms a sort of pouch. 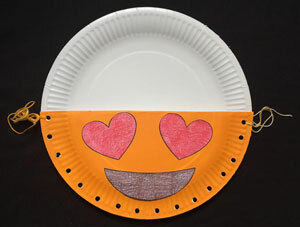 (Optional: You can paint the inside of the second paper plate if you want. I left it white becaue I thought the emoji face stood out more). Hold the paper plates in place with tape, string, or bull clips. With a hole punch, punch holes all the way around the edge of the half plate, but through both plates. Tie wool in a knot around the first hole. (If you don’t have wool you can use other string, like embroidery thread, but I recommend using a few lengths of it to keep the plates secure). With the wool, “lace” the half plate to the full plate. (you can “sew” the plates together using any stitch you like) — I have a simple whip stitch pictured, but you could do a running stitch or a blanket stitch. Write one letter of your name onto each smaller heart until you spell out your name. (We’ve included these in the templates, but you can also cut these out of construction paper if you’d prefer). 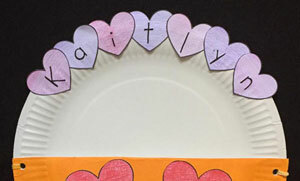 Glue the hearts onto the top of the paper plate so that it shows your name. 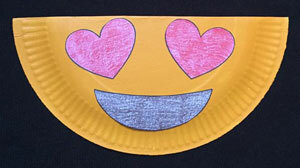 Hang onto the wall or bulletin board and use the pouch to hold Valentine’s Day cards. Fun ideas to do with kids! Thank you! Happy Valentine’s Day to you!